I wrote last week about the Indie Web: the way that the web has the ability to help us grow and connect as individuals in awesome new ways. For as long as I can remember, I’ve loved doing everything by bike. As a kid, the bike was my favorite way to get around, and to this day I use my bike daily to run errands and get places. I particularly love using my bike for actual tasks, not just for “going for a ride” — I think there is something natural and awesome about that, as I’ve written about before. And I’ve also always been a bike hacker. I distinctly remember taking my first bike apart and spray painting it all different colors. 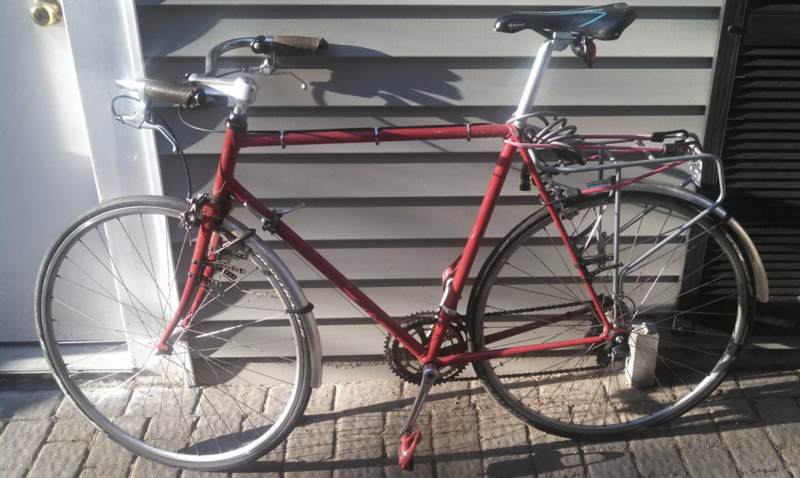 My current bike is a 1970s racer hacked to become a fast city bike. It’s awesome. For a long time, I’ve wanted a cargo bike – these are regular bikes hacked to accomodate passengers and other loads. They’re super popular in Europe, in particular places like Copenhagen and Amsterdam. It seems so obvious to me that I should be riding my kids to school and to the park in one of these things. The fact that I don’t have one is majorly disappointing. But, the problem is that they’re super expensive. Buying a brand new cargo bike from one of the manufacturers in Europe or the US can run upwards of $4k. And, there’s virtually no secondhand market for cargo bikes in the US — I assume both because they are relatively uncommon, and because once you have one you tend to hold on to it. So I’ve been trying to figure out how to get ahold of one without dropping crazy dollars. 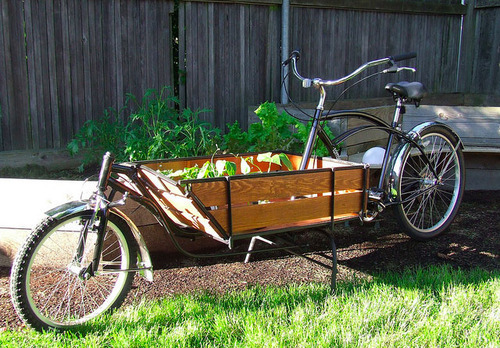 The other day I tweeted out my problem, and within five minutes was pointed to something amazing: Tom’s Cargo Bikes. Tom is a former muscle car builder in — where else — Portland, Oregon, who over the past few years has turned his attention to building custom cargo bikes. His bikes are amazing — choppers of all shapes and sizes, using entirely recycled parts. No two are the same. You can check out all of his bikes here. And, rather than costing thousands of dollars, Tom’s custom bikes start at a much more modest $600. So, for my birthday this year (which is Sunday), we are all chipping in and Tom is going to build me a cargo bike. I am beyond psyched about this, and for so many reasons. I’m going to end up with something way cooler than I could have ever imagined, I’m supporting a super talented craftsman who is building a great small business, and it’s costing way less than any of the alternatives.